Inspired by the novel "The Incredible Tide" by Alexander Key, released in 1970. This is a series so imiginative in its artistry and so mature in its execution, non-anime and non-cartoon fans couldn't help but be drawn in. 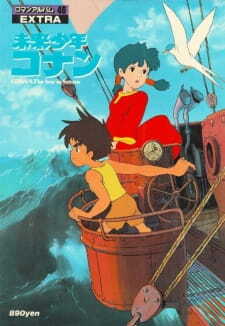 "Future Boy Conan" provides one of the best examples of animated storytelling available to watch. To boot, its one of the most entertaining stories I've had the pleasure of watching. FBC is so entertaining because of its high technical and artistic merits. Technically, the animation and artistry is hard to match even today. The imaginitive settings are gorgeously rendered, and the shear number of places the story goes, like a giant solar tower or a flying fortress or rocket-come-house, will keep you entertained and amazed. While the character designs are decidedly muted, it allows for truly comprehensive and kinetic animation. Each character is defined more through the detailed animation of their little actions and quirks than anything they say. Watch the amazing gymnastic feats of Conan (titular boy of the future), and you will be as impressed as the more technically advanced action shows of modern times. Of course, it's unfair to both "Future Boy Conan" and modern series to make comparisons between the two. FBC aims for much different goals than most modern action or drama shows. Specifically, FBC is less focused on its characters (each one more archetype than flesh and blood) and more plot and adventure oriented. Not to say the characters aren't entertaining, but don't expect real connections with any. "Future Boy Conan's" real strength is its charm. If you have seen any Studio Ghibli films, you will be familiar with Miyazaki's trademark whimsy present through all of FBC. The entire series feels like a classic Ghibli film extended into a 26 episode series. For any fan of animation and adventure, that is a good thing. I cannot recommend this series enough. "Future Boy Conan" is a real gem among animation. With child-like exuberance, the story never fails to engross you in its drama, but still maintains a kind of maturity in its animation and direction that makes it accessible to all audiences. the story is based on this planet, after the mankind has destroyed and polluted the earth in a world war. The story starts on a small island, where Conan lives with his grandfather, thinking they are the lone survivors of the war. But they come to see that there are others alive when a girl washes on the shore of their island.. The Story is an instant classic, with the theme of good vs evil. I think the story will appeal for every age, it has these certain catches, and twists in it also. It is also thought that the story and the whole serie is a prototype for Laputa, Castle in the Sky. But still, even if it is a prototype, I consider this anime to be as good as Laputa, or even better. The Animation is expectional for this old anime, obviously there is no CG, and very few duplicate frames. The overall animation is far above the standards of the 70's. The sound is also very good, but not perfect. There are some parts when there could have been better sounds, but still, excellent sound for anime more than 30years ago ! Now.. the characters. They are just excellent, they are all so well designed that you will fall in love with atleast one of them instantly! Conan is your typical wild boy, with a pure heart, and a strenght beyond a normal human. And he is the character I loved second-most in this serie. And of course the heroine part is played by a girl named Lana. I think she develops as a character excellently. There are also bunch of a bit side-characters but still extremely well developed! Overall this anime is one of the best I've ever seen, with excellent and intriguing story, very good animation, and lots of memorable and excellent characters. This anime deservers a lot more appreciation that is has gotten. Don't look at the year when this anime was made, and don't start watching it with prejudice. Just go and buy this anime or download it from some fansub group, I guarantee that you won't be disappointed!! This may be the greatest animated series, not just anime, I have ever seen. It is a true classic and perhaps Hayao Miyazaki's overall best work. While his later films with Studio Ghibli are technically better, in terms of art, animation, sound etc., there is such a great charm to this old series that it just doesn't matter. Plus, a lot of ideas and concepts from FBC have been repeated in those later works. I mean, just look at the similarity between this series and Laputa, Castle in the Sky. What makes it so great is the fact that the most important part, the story, is so simple, but at the same time so complex. It is a fun adventure story on the surface, but at its core it touches on some rather deep themes about humanity, our relationship to the earth etc. The series also has a perfect pace. Never was there a moment in the series, in all its 11 hour length, that I felt bored or lost interest. When there is action it is flawlessly directed and always engaging, and when there are quiet moments there is always room for contemplation, we are given room to breath and take in the fantastic scenery of the amazing world. The characters are likewise very interesting and compelling. While one could categorize them as cliché at first, Conan being the classic hero, Lepka being the sinister villain and Lana being the damsel in distress, you will find that the situation becomes much more complex as the series goes on. Characters are developed in an utterly believable and very compelling way. In the end I cared for every single one of them. Although I stated that the technical aspects are much better in later works, that doesn't mean they are bad in this series. In fact, considering this is an anime TV-series from 1978 the art and animation is extraordinary. Just look at the detailed backgrounds in any landscape scene and the great use of color, both on the backgrounds and the character cels. The art is actually much better than it is in a lot of what's being made today. The animation, while limited, is very dynamic, ranging from cartoon goofiness to serious realism. This dynamism owes a lot to the simple, but perfect, character designs. Although the music has an old school 70s feel it works really well within the show and you quickly get used to it. The opening and closing themes may put someone off, as they seem a little childish (which was my first impression), but as the series goes along they grow on you. The voice actors also do a phenomenal job. Overall, this is a fantastic series, one of my favorites. I like it so much I've actually seen it three times, and I will definitely see it again. If you want to see how great an old-school anime can be, look no further. It's also Hayao Miyazaki at his best, and any fan of his later works, especially his action epics like Laputa, should definitely check this series out. Mirai Shounen Conan or Future Boy Conan is a show directed by highly acclaimed director Hayao Miyazaki. I had my hopes up going into this series, but I was not too excited as I am not the biggest fan of Miyazaki. So with that in mind, would this be the show that would finally make me love Miyazaki as much as everyone else, or would this be just another Miyazaki work to me? In the show we follow Conan. A boy who has been raised by his grandfather on a small island known as remnant island. They live their peaceful daily lives alone as the two sole survivers left on the island and possibly on earth. However, one day a young girl named Lana washes ashore. She claims to be from a place called High Harbour and that she has escaped from some kidnappers who were trying to take her to a place called Industria. However just after Lana has recovered some people from Industria shows up and kidnaps her. Conan decides to try to go after them and try to save Lana. He hopes that she can show him where High Harbour is. First thing first, this show looks good. I was shocked that this was a 70s shows. It looks nothing like it. The art and designs are really good and the animation is good throughout the entire show. I can only really think of one moment where the animation became a bit choppy. Thankfully though, the show is not just pretty to look at, it also has a pretty good story. I really enjoyed watching this show. It might be my favorite Hayao Miyazaki work besides Lupin. If you are a fan of Miyazaki you should really do yourself a favor and watch this show. I would honestly put this show up as a must watch for any anime fan.